Home Blog Win an Autoglym Set in QuoteSearcher’s Christmas Giveaway! Win an Autoglym Set in QuoteSearcher’s Christmas Giveaway! After a hard day’s at work most motor traders don’t have the time or the energy to look after their own cars, and unfortunately this means they can become neglected. However, we are giving away an Autoglym Perfect Bodywork and Wheels set which we know will be too tempting for any motor trader not to use! Known as one of the most premium car care ranges, Autoglym’s Perfect Bodywork and Wheels set contains everything you need to make your car look as good as new (it’s also a great present for Christmas!) 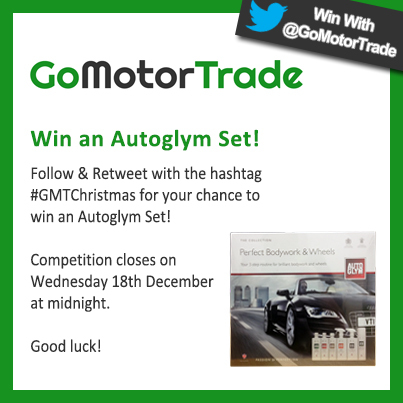 For your chance to win this prize just follow us on Twitter @GoMotorTrade and retweet using the hashtag #GMTChristmas. Competition closes Wednesday 18th December at midnight. Good luck! Winner will be chosen at random and announced on Twitter once all the entries have been counted. Prize must be claimed within 7 days or the winner will be redrawn.